Another year of rapid growth is expected in the Myanmar market as international and domestic carriers continue to expand in response to growing business and leisure demand. Myanmar’s international market has already recorded a 64% capacity increase in the nine months since Aung San Suu Kyi’s National League for Democracy won landmark elections in Apr-2012, leading to the rapid opening up of the Southeast Asian country and the lifting of economic sanctions. Eight foreign carriers have since launched services to Myanmar while several carriers which already served the country added capacity. Following the 09-Jan-2013 addition of Dragonair, Myanmar is now served by 21 foreign carriers which account for about 80% of total capacity to and from the country. 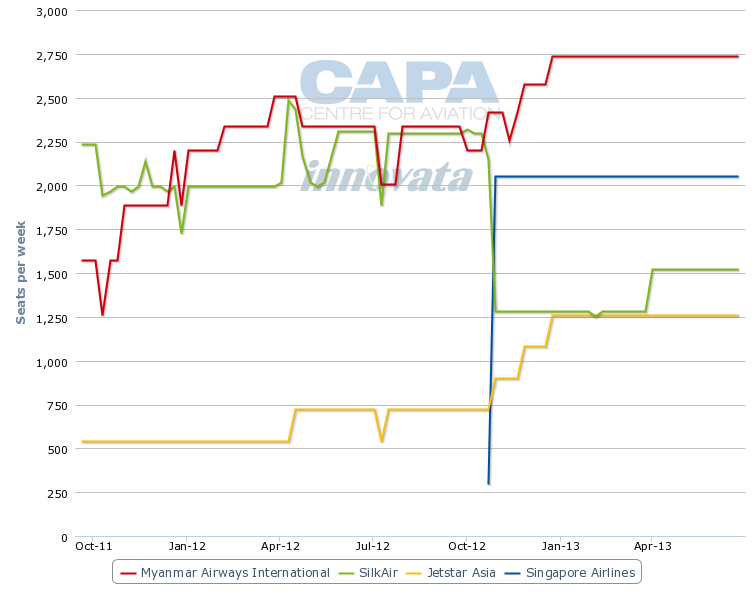 International carriers will continue to expand their operations to Myanmar in 2013 although at a more modest level as it will take time for the capacity added in 2H2012 to be absorbed, particularly given the shortage of hotel rooms and other infrastructure constraints. However, 2013 could see more rapid domestic growth as the country’s six existing domestic full-service carriers look to profit from growing demand for travel within the country and Myanmar’s first low-cost carrier, Golden Myanmar Airlines, enters the market. 2013 will also be a key year for airport expansion projects as private consortiums take over at Mandalay and start building a new airport outside the main city of Yangon. Myanmar’s international market currently consists of about 81,000 weekly seats, including over 75,000 seats at the country’s main airport in Yangon and about 5,500 at Mandalay, according to Innovata and CAPA data. In Apr-2012 the Myanmar international market consisted of only about 49,000 weekly seats, including 47,000 seats at Yangon and 2,000 seats at Mandalay. Note: based on capacity for weeks commencing 14-Jan-2013 and 16-Apr-2012. ANA capacity included although the service is temporarily suspended from 5-Jan-2013 to 28-Jan-2013 due to maintenance. The 64% growth in Myanmar’s international market over the last nine months, and the 60% growth at Yangon, was driven primarily by the entrance of new foreign carriers. Eight new airlines have begun serving Yangon over the last four months – All Nippon Airways (ANA), Asiana, Condor, Dragonair, EVA Air, Korean Air (KAL), Qatar Airways and Singapore Airlines (SIA). All the new routes began in the last four months of 2012 or, in the case of Dragonair, early Jan-2013. The Cathay Pacific subsidiary began serving Yangon on 09-Jan-2013, with four weekly flights from Hong Kong using A321s. Six of the routes launched provided Yangon with new non-stop destinations – Doha (Qatar Airways), Frankfurt (Condor), Hong Kong (Dragonair), Seoul (Asiana and KAL) and Tokyo (ANA). Previously Yangon was only connected with other destinations within Southeast Asia as well as China, India and Taiwan. The new connections with Hong Kong, Korea, Japan and Qatar are significant as they open up more options for long-haul passengers. ANA, KAL, Dragonair/Cathay and to a lesser extent Asiana are targeting passengers heading to Myanmar from North Asia as well as the Americas, particularly the US where there is growing business demand following the lifting of US sanctions. US President Barack Obama became the first US president to visit Myanmar in Nov-2012. ANA, Cathay and KAL all have large networks in the US. Qatar Airways, which began serving the Doha-Yangon route in Oct-2012 with a daily A319 flight, is also offering connections to the eastern US as well as to Europe, Africa and the Middle East. Qatar, ANA and Dragonair are all operating narrowbody aircraft to Yangon, which allows the carriers to initially test the market with minimal risk. ANA particularly has a limited amount of capacity in the market as it is serving Tokyo-Yangon with one of its two all-premium 737-700s. As demand grows, particularly leisure demand, more widebody services could be added. ANA CEO Shinichiro Ito told CAPA in Nov-2012 that the carrier’s Yangon service is capped at three weekly flights due to bilateral restrictions but the carrier has the flexibility to add capacity without increasing frequencies by up-gauging the route to widebody aircraft in two-class configuration such as 767s or 787s. ANA launched service to Yangon in Oct-2012 using 737-700s configured with 38 business class club style seats. The service is being temporarily suspended from 5-Jan-2013 to 28-Jan-2013 as the aircraft is overhauled and retrofitted. The new configuration will feature 24 business class seats and 10 premium economy seats - the premium economy seats will be identical to the 38 seats which were previously marketed as business while the business class product will be improved. ANA in 2007 quietly began experimenting with 737s in all-premium configuration, initially on the Tokyo-Mumbai and Nagoya-Guangzhou routes (the latter was subsequently dropped). Mr Ito still considers the ANA Business Jet operation, which has never expanded beyond the initial two aircraft (one of which had the 38-seat all-business configuration and one of which initially had a two-class configuration with 24 business class and 20 premium economy seats), a “test”. Asiana and KAL are already using widebody aircraft to Yangon, with KAL launching daily A330 service in Sep-2012 and Asiana following with two weekly seasonal 767 flights which will only operate from 19-Dec-2012 to 03-Mar-2013. The more ambitious approach from KAL gives the SkyTeam carrier a much larger share of the market than any of the other carriers that have launched medium or long-haul routes into Yangon in recent months. KAL is now the seventh largest international carrier at Yangon and accounts for 5% of total international capacity at the airport. Asiana, with its low-frequency seasonal service, is targeting predominately leisure traffic while ANA, Dragonair/Cathay, KAL and Qatar have entered the Yangon market primarily to attract business traffic. Condor is seeking entirely to tap into growing inbound tourist demand. Condor’s one weekly 767 flight to Yangon allows the German leisure carrier to test out the market and give it potential first mover advantage as Myanmar gains popularity among European tourists. If successful, the route could be expanded and transitioned to a non-stop in both directions. It currently operates on a Frankfurt-Yangon-Phuket-Frankfurt routing, which further minimises Condor’s risk as the carrier can sell more Phuket seats on weeks there is limited or no demand for Yangon. The other two carriers which have launched service to Yangon in recent months have resulted in more capacity in some the Yangon’s larger international markets. The new daily SIA flight, which replaced seven of the 16 weekly frequencies previously operated by SIA regional subsidiary SilkAir, provides additional capacity in Yangon’s second largest international market. SIA and SilkAir combined now offer over 6,600 weekly seats, up by about 40% from the approximately 4,700 seats provided before SIA entered the market at the end of Oct-2012. SilkAir, which operates A320s, will add another two weekly frequencies in the Yangon market at the end of Mar-2013 for a total of 11, which will expand SIA Group’s capacity at Yangon by another 7% to over 7,100 weekly seats. The SIA Group now accounts for 8% of total capacity in Myanmar, making it the third largest foreign airline group serving the country after the AirAsia Group and Thai Airways. Jetstar Asia also has more than doubled capacity on the Yangon-Singapore route over the last nine months as its service has increased in phases from three weekly frequencies to daily. In total, capacity on the Yangon-Singapore route, which is also served by Myanmar Airways International (MAI) with 17 weekly non-stop frequencies and seven frequencies via Bangkok, has increased by almost 50% over the last nine months to about 7,000 weekly one-way seats. Taipei is now the fifth largest destination from Yangon following the launch of services from EVA and an increase in capacity from China Airlines (CAL). EVA launched thrice weekly services in the Yangon-Taipei route in Oct-2012 while CAL has expanded its Yangon 737-800 service from three to six weekly flights in phases over the last several months. There are now 1,500 weekly one-way seats on the Yangon-Taipei route compared to less than 500 seats in Apr-2012. Yangon’s, biggest destination, Bangkok, also has seen a significant increase in capacity over the last nine months as all three Thai carriers serving the route added capacity in 2H2012. Thai Airways and Thai AirAsia both added a third daily frequency while Bangkok Airways has added a second daily frequency. As a result, the market (includes both Bangkok airports) has seen a 36% increase to almost 15,000 one-way seats. Thai Airways operates A300 and A330 on all three of its daily frequencies to Yangon. Thai was the only widebody operator in the country before the entrance of Asiana, Condor, KAL and SIA – which illustrates the historical and continued importance of the Yangon-Bangkok market. MAI also serves Bangkok with three daily A320 flights. There also has been a 48% increase over the last nine months in total capacity in the third largest international market from Yangon, Kuala Lumpur, to about 4,800 one-way seats. 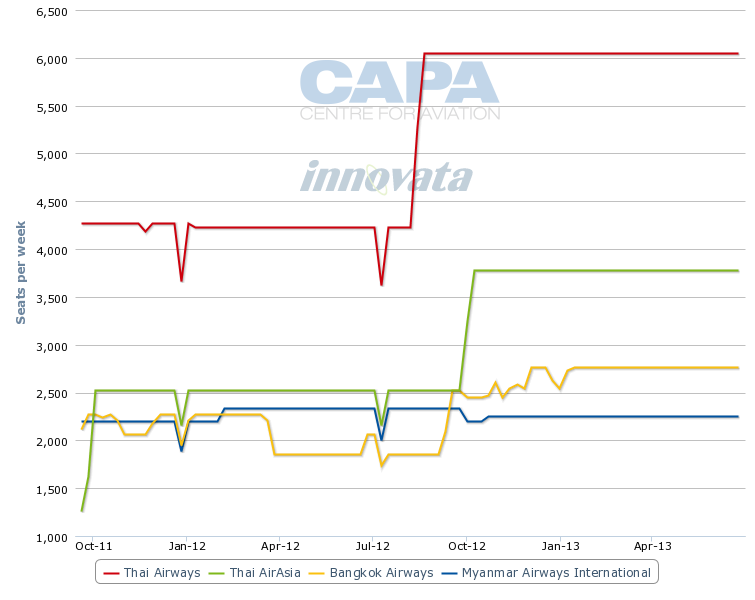 The Yangon-Kuala Lumpur market will grow by another 10% at the end of Mar-2013, when Malaysia Airlines adds three weekly frequencies for a total of 10. AirAsia expanded the route in Oct-2012 from one to two daily frequencies. Myanmar Airways International (MAI) also has added capacity to Kuala Lumpur, which it now serves daily, as part of a 32% increase in international capacity made possible by the expansion of its small A320 fleet. Myanmar’s only international carrier now serves seven destinations, two of which were launched in Nov-2012 – Phnom Penh and Siem Reap in Cambodia. MAI is the smallest flag carrier in Southeast Asia – smaller even than Lao Airlines, Cambodia Angkor Air and Royal Brunei Airlines – and accounts for only 21% of international capacity to and from Myanmar. The fact that growth in the three largest markets from Yangon – Bangkok, Singapore and Kuala Lumpur – has not quite kept up with the overall international capacity growth at Yangon is an indication that more long-haul passengers are starting to transit at other Asian hubs. While these three markets will likely continue to grow fuelled by local demand given the strong economic ties Myanmar has with Singapore and Thailand, its flag carriers no longer dominate long-haul traffic to and from Myanmar. The emerging Myanmar-North America market is particularly better served by the North Asia hubs which have gained Yangon service in recent months as there are no non-stop flights from Southeast Asian gateways to North America (with the exception of the Singapore Airlines’ all premium non-stop flights to Los Angeles and Newark, which are being discontinued in 2H2013). However, Bangkok, Singapore and Kuala Lumpur are well positioned to capture the growth at Myanmar’s second international market, Mandalay. Thai AirAsia has already launched service to Mandalay, which previously only had one international route – a China Eastern regional jet service from Kunming in the neighbouring Chinese province of Yunnan. Thai AirAsia began serving Bangkok-Mandalay in Oct-2012 with four weekly flights and is upgrading the route to daily on 11-Jan-2013, an indication that the Mandalay market remains under-served. Bangkok Airways has unveiled plans to join Thai AirAsia on the Bangkok-Mandalay route with four weekly A319 flights beginning in Sep-2013. Thai Airways is also considering serving Mandalay using its regional unit Thai Smile, which operates A320s. Mandalay, a popular tourist destination with some of Asia’s most remarkable but lesser known Buddhist temples, will also likely attract service to Kuala Lumpur and Singapore. AirAsia, given the initial success of its Bangkok-Mandalay route, would be the most likely operator on Kuala Lumpur-Mandalay, while SilkAir and potentially Jetstar could operate Singapore-Mandalay. Offering direct services to Mandalay gives tourists the option of bypassing Yangon and heading straight to Mandalay and Bagan, another popular tourist destination located between Mandalay and Yangon that has a small airport that only handles domestic flights. Myanmar’s newest airline and first low-cost carrier, Golden Myanmar Airlines, is also targeting international routes from Mandalay. Golden Myanmar plans to launch in 1Q2013, possibly by the end of Jan-2013, with domestic services between Yangon and Mandalay. But the start-up aims to become the second local carrier competing in the international market. Currently the country’s other six carriers only operate domestically. Golden Myanmar’s business plan envisions operating A320s on several international routes from Mandalay, including to Guangzhou and Hong Kong. It also plans to operate international routes to Southeast Asian destinations from Yangon. The new company is headquartered in Yangon but plans to base and overnight its aircraft at Mandalay. This plan is partly driven by congestion at Yangon, where there is a lack of overnight parking spots to accommodate additional aircraft, but also because it sees opportunities in the Mandalay market. Golden Myanmar plans to rotate its A320s through Yangon, where there is currently only four air bridges and six remote stands, during less congested hours. For its Yangon international routes, it plans to originate and terminate the flights in less congested Mandalay, where there is ample capacity. The Yangon airport is expected to be upgraded as an interim measure while a new airport is constructed. But until the new airport opens, which is not expected until at least 2016, the country’s existing carriers and the foreign carriers already serving Yangon will likely have an advantage over any potential new entrant in securing additional gates or parking spots. There is plenty of space at Mandalay, where there is as much capacity as Yangon despite handling one fifth the amount of traffic. A third international airport also opened in late 2011 at Naypyidaw, Myanmar’s new capital city, but there is not yet sufficient demand to support international services as the city is still very small. Golden Myanmar’s business plan envisions launching with two A320s in single-class 180-seat configuration and adding one additional A320 every six months. The proposed carrier has big ambitions and is confident it can stimulate local demand by offering low fares. But its impact on the market could ultimately hinge on its ability to attract investment from a foreign LCC group. While Golden Myanmar is prepared to launch services without a partnership (or investment) from a foreign LCC, a tie-up would clearly help the start-up in the international market. As Myanmar (particularly Mandalay) is primarily an inbound market, having a tie-up with an established Asian LCC could be critical. If Golden Myanmar is willing to adopt the brand of an established Southeast Asian LCC and embrace a more comprehensive partnership, assuming Myanmar authorities would allow such an arrangement, it would have a significantly higher chance of success. Golden Myanmar has talked to several foreign LCCs, including Jetstar and Tiger, since establishing the company in early 2012. Golden Myanmar prefers an operational partnership rather than a joint venture. Foreign LCCs, however, typically prefer a more active role and extending their brand to new markets such as Myanmar through a franchise or affiliate model. Southeast Asia’s leading LCCs, including AirAsia, have expressed interest in potentially establishing an affiliate in Myanmar. AirAsia, Jetstar and Tiger now have carriers in all six of the largest markets in ASEAN – Indonesia (AirAsia and Tiger), Thailand (AirAsia), Malaysia (AirAsia), Singapore (Jetstar and Tiger), the Philippines (AirAsia and Tiger) and Vietnam (Jetstar). Myanmar, now that it has opened up, represents the last major untouched market in the region. Technically there are three other ASEAN countries that still do not have local LCCs but these markets (Brunei, Cambodia and Laos) are not seen as large enough to support a home-grown LCC. LCCs, led by AirAsia, have succeeded at capturing about 20% of Myanmar’s international market. But having a local carrier would support an even higher LCC penetration rate as services to markets outside Southeast Asia, particularly greater China, could be opened up. A local affiliate would also be needed for Asia’s leading LCC groups to access Myanmar’s domestic market, which is the sixth largest domestic market in Southeast Asia and has high growth potential. Myanmar’s domestic market is now highly fragmented and served by six carriers – Air Bagan, Air KBZ, Air Mandalay, Asian Wings, Yangon Airways, and government-owned Myanma Airways (MAI currently only operates international services). The six carriers only operate regional aircraft, primarily turboprops, with 100 seats or fewer. The ATR turboprop is by far the most common aircraft type in the country and is in service at all six carriers. Myanma Airways recently leased two E190s, a key fleet upgrade initiative which could be matched by some of the other carriers. Industry sources say all the domestic carriers are generally unprofitable, despite relatively high load factors, as domestic fares are very low. Labour costs are low but operating costs could be lower if the carriers were larger and could enjoy economies of scale. Opportunities to reduce costs through partnering, in such areas as maintenance and joint purchasing of ATR parts, are currently not explored, hurting profitability. While Myanmar’s domestic market can support multiple carriers, consolidation is inevitable. An LCC entering the domestic market could accelerate such consolidation. A LCC may not be able to significantly reduce domestic fares but would come in with a much lower cost structure that would allow profitability at current fare levels. As Myanmar develops and discretionary income increases, demand should grow even if fares are not significantly lowered. As the country opens up to tourism, higher yielding tourists will also fill up more seats on domestic routes. Some of the existing carriers will likely look at adopting the LCC model and transitioning to larger aircraft, potentially in partnership with foreign LCCs. But such partnerships will not be easy to secure. Negotiations between leading LCC groups and local entities are always tricky and can drag on for several months or even years. There will also likely be several companies – existing carriers and new companies or group of investors – looking at launching a LCC in Myanmar although Golden Myanmar appears the most advanced with its plans. While there are potential domestic opportunities for LCCs given the size of and geography of the market, these opportunities could be limited to trunk routes. There are currently about 20 airports with commercial service in Myanmar and about 1.5 million annual domestic passengers in the market. But there is insufficient demand and airport infrastructure to support A320s or 737s at most domestic destinations. The 25-Dec-2012 crash of an Air Bagan Fokker 100 at one of the country’s domestic airports highlights the infrastructure limitations. The aircraft crashed on approach to Heho during poor weather, resulting in two fatalities and at least 11 injuries. The Heho airport only has a NDB approach rather than a more modern ILS system although it is the country’s largest domestic airport after Yangon and Mandalay based on current seat capacity. Airports outside Yangon, Mandalay and Naypyidaw generally lack modern technology, ground support equipment and re-fuelling services. While the government has a programme in place to modernise its domestic airports, which could be accelerated in the aftermath of the crash, the priority has been in privatising and upgrading its international airports. In Dec-2012 Myanmar’s DCA pre-qualified seven consortiums for a contract to operate and further develop Mandalay International Airport. A contract is expected to be awarded in Apr-2013. While the airport will ultimately need to be expanded the situation is not as pressing as Yangon because Mandalay Airport’s current capacity is three million passengers per annum. Mandalay handled only 500,000 passengers in 2011. Yangon’s current capacity is also three million passengers per annum. The airport handled 2.5 million passengers in 2011, including one million domestic and 1.5 million international passengers. It likely exceeded the three million mark in 2012 as Yangon reported traffic of 1.5 million passengers in 1H2012 – before there was an influx of new international carriers. Yangon has launched a project aimed at increasing capacity to about 5.5 million passengers per annum, which is seen as an interim solution until the new Hanthawaddy International Airport can be built. Myanmar’s DCA has pre-qualified seven consortiums to design, build and operate the new airport, which is expected to open in 2016 about 80km outside Yangon. Contract award and ground-breaking is expected during 2013. Airport infrastructure is not the only challenge which could potentially hamper growth in Myanmar. Political instability remains an issue, especially in light of the recent fighting between government forces and a rebel group in the north of the country. A shortage of hotels, particularly in Yangon, and tourism infrastructure is also a concern as the 21 international carriers which now serve Myanmar consider adding more capacity. Given the huge influx of new international flights added over the last four months, several of the carriers serving Yangon will be cautious and will make sure the capacity added is absorbed before making further additions. While demand for services to Myanmar increased rapidly as the economy opened up, in some cases too much capacity was added too quickly as carriers raced to establish a presence in the country ahead of competitors. 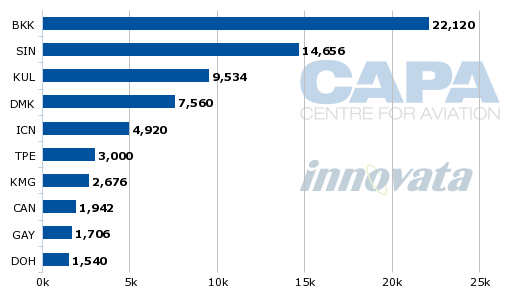 Even if 2013 does not see a large number of new international flights launched, traffic in Myanmar will grow significantly in 2013 as most of the capacity added in 2012 was added late in the year. The medium and long-term outlook for Myanmar remains bright as the market is still relatively under-served. The 81,000 international weekly seats currently in the market is a small figure given the size of the country and expansion of the economy. Malaysia, for example, has just under half the population of Myanmar but more than 10 times the amount of international seats. In Southeast Asia, only tiny Laos and Brunei currently have smaller international markets. Even Cambodia, which has about one third the population of Myanmar and is similarly undeveloped, has about 50,000 more international seats. There will be challenges and a risk of short-term over-capacity in some markets. But if Myanmar remains on a stable political footing, there will be opportunities for carriers of all types – local and foreign, low-cost and full-service.